The Museum of Slavery in the village of Albreda first opened in 1996. 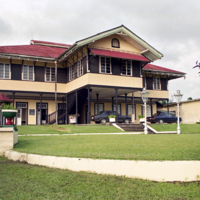 It is housed in the Maurel Fréres building which was built by the British colonial government in the 1840s. Only a short distance from Juffure, the home of Kunta Kinte - the main character of Alex Haley's 'Roots' - the museum is dedicated to interpreting the history of transatlantic slavery in the area. It is a hub for students and researchers. 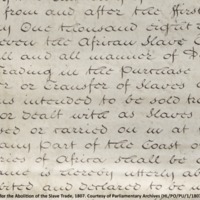 The museum's displays use a collection of artefacts to examine the process of enslavement, with particular focus on capture and the Middle Passage. These artefacts include chain neck collars, foot cuffs, yokes and manillas. The museum also has a display about 'Roots'. Guided tours are regularly welcomed to the museum. Visitors are also frequently taken to visit the nearby 'factory' ruins which was once used as a slave station by French and British colonial administrations. 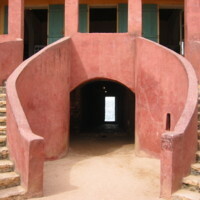 Le musée d'histoire de Ouidah (The Ouidah Museum of History) is located within the Old Portuguese Fort in Ouidah. The Fort was used to contain and transport enslaved Africans as part of the transatlantic slave trade, serving as the site for diplomatic presence of Portugal in the area. The fort became property of the Dahomean government in 1961, when it was restored and turned into a museum, opening in 1967. It is managed by the Department of Cultural Patrimony. 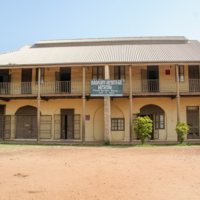 The museum's collections are grouped into six major exhibit themes: the Portuguese Fort (in which the museum resides), the Kingdom of Xwéda, the Kingdom of Dahomey, the Slave Trade, Vodun, and the cultural links between Benin and the New World. 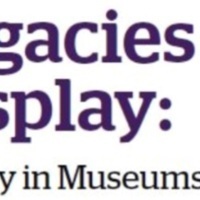 These collections are made up of artefacts, photographs and objects that have significant meaning to the history and culture of the museum's local area. The history of slavery runs throughout the displays; from the Portuguese Fort display which discusses how enslaved Africans were kept there. The displays that explore the kingdoms of Xwéda and Dahomey use collections to emphasise the extent to which both of them were dependent on the trade in enslaved individuals with Europeans for riches and power. These include a range of archaeological finds, as well as engravings and drawings. The exhibition about the religious traditions of the area, in particular the development of Voodoo, reflects on the continued use of African religions by enslaved people in the Americas during the period of the transatlantic slave trade, using religious artefacts. A range of images and objects showcase the impact that people from Benin made on the cultures of New World societies, as well as the effects of mass repatriation to Benin after the decline of the slave trade. 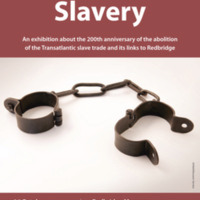 The Slave Trade exhibits examine the system of transatlantic slavery from the sixteenth to the nineteenth century and how it impacted on the local area. 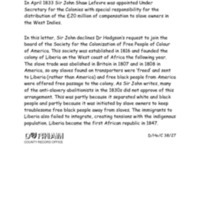 The main focus is on the economic and social processes that the slave trade created in Benin, capture, enslavement and the Middle Passage. These themes are illustrated with a range of objects, artists' renditions and archival materials. Examples of objects on display include chains and yokes. Images are also used to give some information about the plantation system in the Americas and Caribbean. The museum is located on Gorée Island, 3 km off the coast of Senegal. The structure was built in 1776 as a holding centre for Africans waiting to be exported across the Atlantic. It was converted into a museum and memorial in 1962. 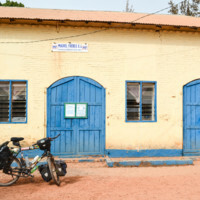 According to the original curator of the museum, Boubacar Joseph Ndiaye, the island played a pivotal role in the containment and transportation of slaves to America during the transatlantic slave trade. The aim of the museum and memorial is to help its visitors come to terms with the extent of the transatlantic slave trade and the effects of the trade on Africa and its people. It was designated a UNESCO world heritage site in 1978. 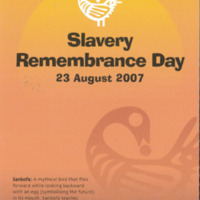 The content of the museum includes murals and artwork showcasing traditional African techniques, and depicting the process of enslavement. There is also a variety of objects such as chains, manacles, and cages which emphasise the brutal nature of slavery. The site itself is accessed via a ferry and the tourism industry of nearby Dakar is linked closely with the island. The key voices addressed within the museum are those of the enslaved; the museum brings visitors into close approximation with the living conditions faced by the enslaved during the transatlantic slave trade. One of the most poignant features is the 'Door of No Return' which is said to be the point where enslaved Africans were boarded onto ships ahead of the Atlantic voyage. 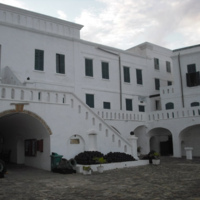 Cape Coast Castle is one of around forty ‘slave castles’ built by European traders on the coast of West Africa and used to hold enslaved Africans prior to their being transported to the Americas or the Caribbean. The first timber construction on the site was erected in 1653 for the Swedish Africa Company named Carolusborg. It was later rebuilt in stone. In April 1663 the ‘Swedish Gold Coast’ was seized by the Danes and integrated into the ‘Danish Gold Coast’. In 1664 it was conquered by the British. Originally used for trade in timber and gold, the castle was later used in the transatlantic slave trade. In the late 18th century it was rebuilt and used as the seat of the colonial Government of the British Gold Coast in 1844. 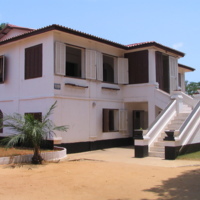 In 1957, when Ghana became independent, the site came under the care of the Ghana Museums and Monuments Board, and was restored for public access in the 1990s. The museum offers guided tours, as well as permitting tours orchestrated by freelance tour guides. There is also a library and a gift shop, featuring traditional Ghanaian arts and crafts, on site. The main aim of the museum is to act as a monument to those taken from Africa and enslaved into the system of Transatlantic Slavery. It features both archaeological and ethnographic collections on displays, within the rooms of the castle. Throughout, there are also a number of contemporary sculptures depicting the heads of victims of the slave trade. Visitors tour through the castle, encountering the rooms in which the enslaved were held, with guides providing further information about the conditions and experiences those thousands of Africans faced. 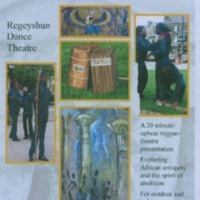 Sugar Beat Skank was a reggae-theatre performance presented by Regeyshun Dance and commissioned by the Leeds Bicentenary Transformation Project. 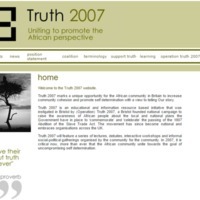 It explored 'African antiquity and the spirit of abolition', and gave voice to narratives linking the histories and cultures of Africa and Yorkshire. Sugar Beat Skank was performed at outdoor and indoor events across Yorkshire, including Ilkley Literature Festival in 2007. 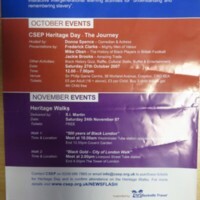 Testament to a Trade was a play produced to mark the bicentenary, with close reference to Oxfordshire. 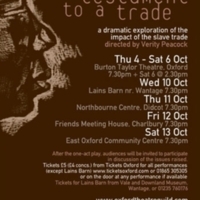 Written by three local writers, the play was produced by Oxford Theatre Guild in collaboration with Oxfordshire Record Office and the Oxford Playhouse. Testament to a Trade weaves accounts of past and present slavery, and is situated in historical and contemporary contexts, notably 18th century Africa and Oxford, and contemporary Eastern Europe and Oxford. 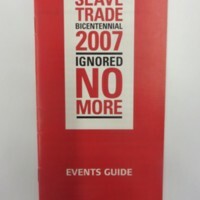 A number of archive materials relating to slavery and abolition are held by Oxfordshire Record Office, information on which inspired elements of the story. 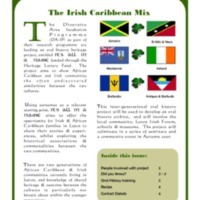 A teachers pack was produced to inform similar projects. The play opened at Burton Taylor Theatre in Oxford, and toured venues across Oxfordshire.